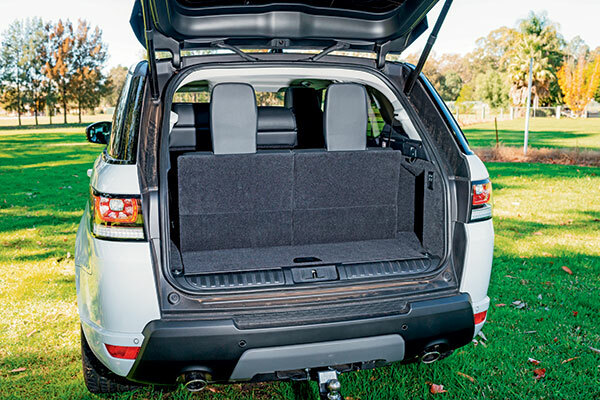 We have always said that the Land Cruiser 200 Series is the king of tow vehicles – but is it? 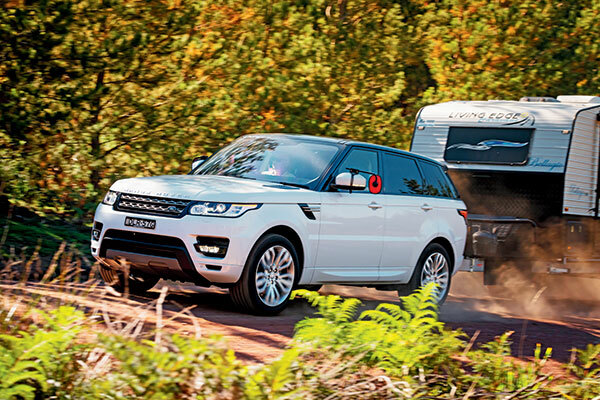 Here, we have the Range Rover Sport, a luxury SUV that has the same towing capacity as a 200 Series and costs pretty much the same as a LandCruiser VX. So could the Rangie be the new towing king? 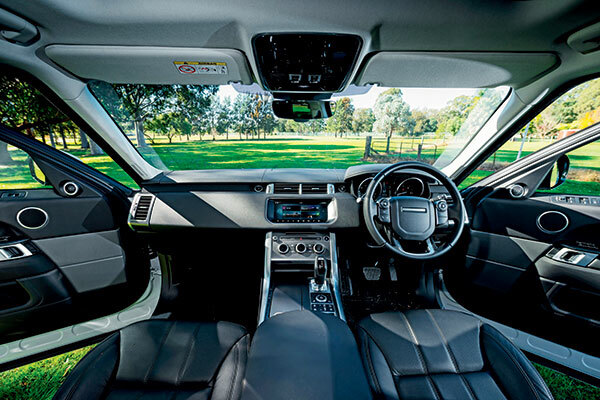 The Range Rover Sport TDV6 SE is one above the entry-level Sport SD4S ($90,900) and opens at $103,900 – with options, that figure can balloon significantly (see specifications panel for optional inclusions). Some of the basic luxury features are covered off – and some are not. For example, you get keyless start in SE spec, but not keyless entry. A feature that is becoming increasingly common as standard equipment in $60,000 cars is an option in this $100,000+ SUV (although remote lock/unlock via a phone app was fitted to the test vehicle as an option). Despite this glaring omission, the rest of the standard features list is what you’d expect for the money: lane departure warning, leather seats, power fold, heated door mirrors with approach lights and auto-dimming, power tailgate, rear view camera, satnav and xenon headlights (you can see the Sport’s full equipment list on www.landrover.com.au). 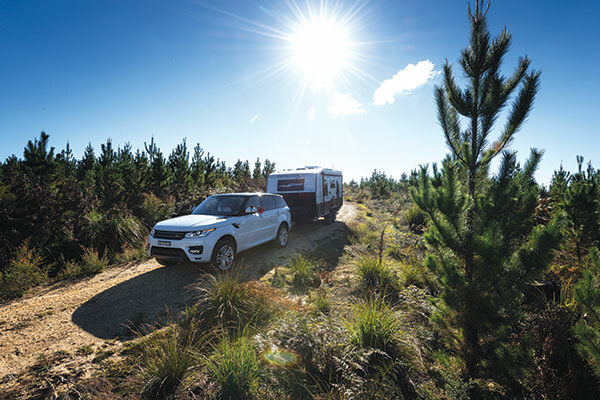 An important towing feature, trailer sway control, is incorporated into the Sport’s electronic stability control safety suite While a full-size alloy wheel is standard with the five-seat model, with the optional seven-seater (as tested) you only get a tyre puncture repair kit. 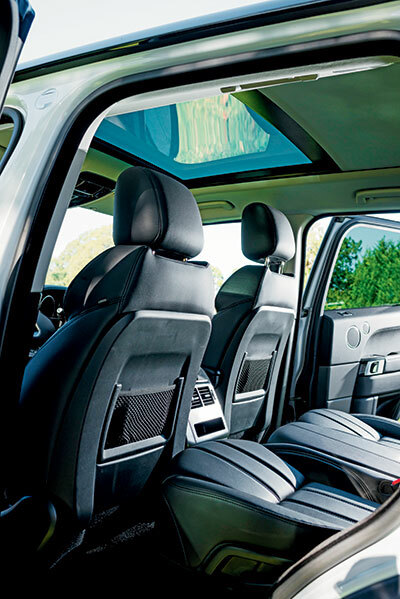 The Range Rover Sport feels luxurious inside with an abundance of quality material all put together well. Seats are supportive and comfortable – except the third-row seats, which are only suitable for sub-teens. They are positioned too close to the floor and lack foot and leg room for adults. 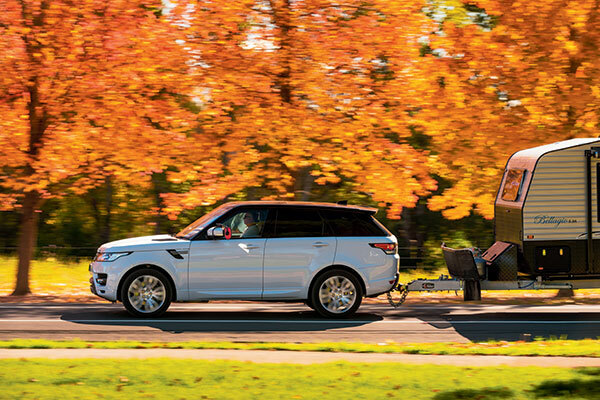 Land Rover does not recommend the use of a weight distribution hitch (WDH) for towing. It does suggest that a smoother take off when towing more than 2000kg is achieved by engaging low range for taking off (then engaging high range). That really didn’t appear necessary with this vehicle; it was quite capable of a smooth and fairly decisive take off in high range. We hitched up a 2480kg tandem offroad van at Camden Caravans, aiming to head south via secondary roads and the Hume Highway to Penrose State Forest. The Rangie’s air suspension settled the body into a level stance with the van hooked up. In this case, ball weight was pretty low at 120kg. 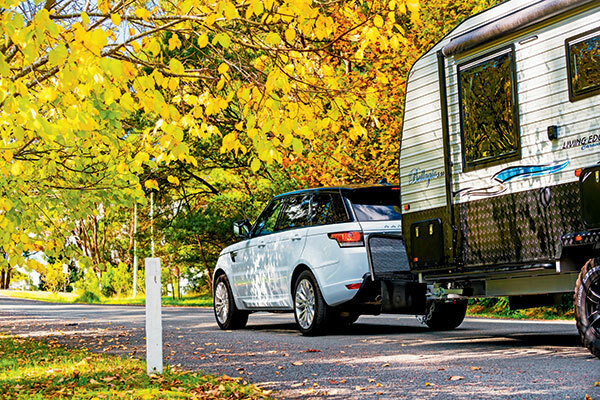 The Range Rover accessory towbar includes a 12-pin connector, and so we were able to easily loop the chain shackles though the cut-outs provided in the towbar. Ramping up speed to the maximum permitted in NSW with this Gross Combine Weight (100km/h with a GCW of more than 4500kg), the air-spring suspension gave a lush ride down the Hume. It was mostly composed on the freeway and on the secondary roads we took around Penrose State Forest – there was very little float, despite the suspension’s softness. Even better was that there was no sway, even when being pushed a little by the air around large trucks as they passed or when we passed them. However, the steering is low geared, meaning that I felt the caravan move around a little with small corrections at the wheel. While it didn’t develop into anything sinister, it did make you cautious with steering inputs. 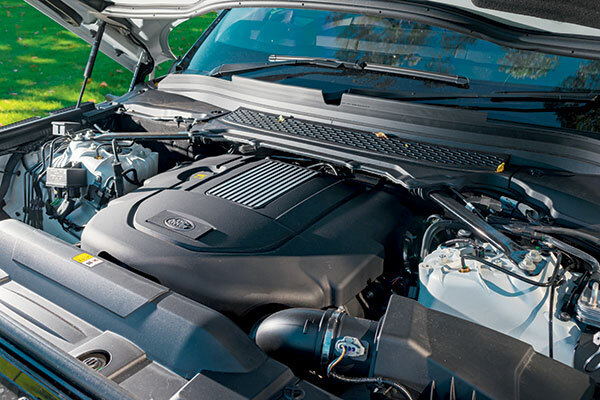 The turbodiesel six is a smooth and willing engine without a caravan behind. It spins out smoothly to around 3500rpm before the eight-speed auto changes up a gear, again with precision and smoothness. The only disappointment with this engine is some low-rpm turbo lag. It is not the worst turbodiesel vehicle for it, and where it shines is that the transition from low or no boost to the healthy mid-range (peak torque arrives at 1750rpm) is relatively smooth and progressive. Fuel consumption on an easy highway cruise with no load aboard except the driver was down to 7.3L/100km. The good thing about this powertrain was that it still felt eager with a significant 2.5 tonnes hitched up behind it. The Sport settled into an easy cruise; it did tend to favour seventh gear (instead of eighth) revving at a bit over 2000rpm at 100km/h. Climbing up the Hume’s steep Catherine Hill, the Rangie dropped to 95km/h on the steepest part of the climb at full throttle. It wasn’t long before it was able to climb back to 100km/h. Engine braking was made easier to access thanks to the Sport’s paddle shifts, but the braking itself wasn’t great; dropping down the gears did help peg speed on descents but you still needed to dab the brakes to stop the rig from running away. Fuel consumption over 200km of towing, including several stops and starts for photography, averaged 16.8L/100km. While it performs better than the Land Cruiser 200 towing or not, and has almost as good towing stability as the Cruiser, there is one key thing that the Toyota has that the Rangie never will – a prolific country dealer network if things go wrong on tour, and the sheer volume of sales. 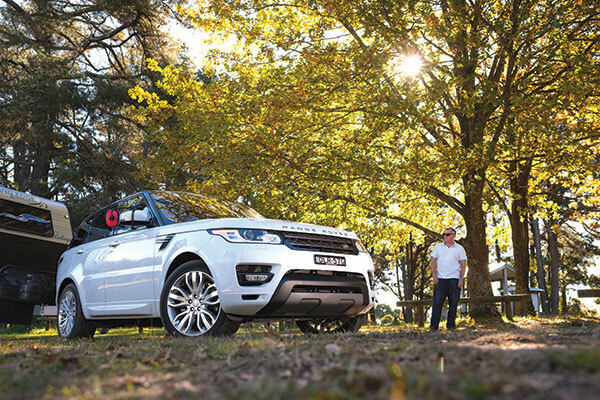 Yet, if you are not going too deep in the outback, the Range Rover Sport continues as before as a strong, stable – and luxurious – tow vehicle. Thanks to Camden Caravans, 66 Camden Valley Way, Elderslie, NSW 2570, (02) 4658 1929, for the loan of the caravan for this test. The full tow test appears in Caravan World #564. Subscribe today for the latest caravan reviews and news every month!